Onkyo C-N7050 review | What Hi-Fi? Is the Onkyo C-N7050 a CD player that can stream, or is it a high-res streamer with a CD player built in? No matter which angle you look at it from, this £350 networked CD player aims to give you access to both worlds – for an attractive price. It’s a nice stepping-stone into the world of hi-fi separates, while giving people the freedom to experiment with different sources before settling on a specific path – an ideal solution for burgeoning hi-fi aficionados. The C-N7050’s sonic presentation is upbeat and smooth, but edges aren’t softened so much that detail is obscured. The Onkyo doesn’t make a fuss with file types, either, having a forgiving balance that makes the most of low bit-rate MP3s while still retaining enough transparency to make listening to 24-bit/192kHz FLAC files a worthwhile experience. Detail is crisply drawn and plentiful. You can hear taut strings being plucked in Public Service Broadcasting’s funky track Gagarin, while the layers of harmonics surrounding piano notes in The Unthanks’ Gan To The Kye are conveyed with passion. Voices are direct and expressive, and it’s easy to get caught up in the lovely melody. It’s a neat and tidy presentation with enough drive and dynamic variation to keep the music enjoyable. There’s a pleasing cohesion throughout the frequency range and a nicely judged tonal balance that refuses to emphasise one frequency band above another. There’s a good level of composure too, so when the music gets complex the Onkyo has the talent to keep every instrumental strand in place and under control. 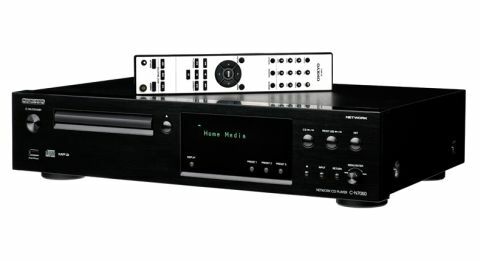 Judged against a class-leading dedicated CD player such as the Marantz CD6005 the C-N7050 lacks a little bite, authority and rhythmic drive. But, importantly, it remains an enjoyable listen, and let’s not forget streams music across a network too. That pleasant sonic character remains constant whether you're listening to CDs or streaming. However, we did find that The Imitation Game soundtrack sounded just a touch more spacious and dynamic when streamed from our server than played on disc. Aside from the CD drive, the only other physical inputs are two USB ports. The front USB is Apple-approved, and will play music stored on your iPhone, iPod and iPod, while also charging them. You can listen to other radio or music streaming apps, as long as your source device is hard-wired to the port. There’s no Bluetooth or AirPlay to stream through, so third-party apps – such as Spotify, Soundcloud and BBC iPlayer Radio – can be played only through wired means. The USB port at the back, meanwhile, will play files stored on a stick or flash drive. To plug the C-N7050 in to your amplifier, you can choose between optical, coaxial and line level outputs. The streamer side of the C-N7050 has plenty of tricks up its sleeve. DLNA support means the Onkyo streamer can play music stored on laptops, smart devices and NAS boxes, as long as they’re all connected to the same network. There’s no wi-fi, so you’ll have to plug the Onkyo to your home network using the ethernet port. It connects instantly, and recognises all devices on the network without a hitch. You can also tune into hundreds of radio stations through the vTuner internet radio service. The Onkyo’s file compatibility is extensive. From MP3 and AAC to high resolution 24-bit/192kHz FLAC and WAV (and 96kHz ALAC), the C-N7050 will play all popular music formats. It supports DSD files, too, although, oddly, doesn’t spin SACD discs. If you’ll be streaming files from a variety of sources, we’d recommend you download Onkyo’s Remote 3 app. It isn’t the slickest of apps, but the simple interface makes it easy to scroll through long lists of songs, while the drop down menu lets you jump between various sources with ease. We found using the remote handset when changing CD tracks more natural, though. The app is free to download, but it’s currently available only for Apple iPods and iPhones – there’s no iPad version, and Android users will have to wait just a little bit longer for the latest version. The C-N7050 is well made with a nice finish in either black or silver. Build quality is decently solid considering the price. The CD loading tray operates smoothly, with no judders or stutters, and the mechanism is pretty quiet. The fascia is neat and orderly instead of flashy, with only basic controls planted on the brushed-metal front panel. The three main buttons – one each for CD, USB and Network – make switching between inputs quick and easy. The Onkyo responds swiftly to any commands, whether from the unit’s buttons and dial, or the ones logically laid out on the remote control. We’d definitely keep the remote in close reach – it’s simple yet intuitive to use – even if we have the control app at hand, too. We have some niggles, though. The player’s large display is easy to read from a distance, but its single line of scrolling text looks meagre. It scrolls very slowly, and the cut-off text can be frustrating to read. We’d like a more sophisticated display – two lines, at least – that gives more information in one glance. We can see the Onkyo C-N7050 having a wide appeal. There aren’t many products that can spin CDs and stream files from one box, and not for such an affordable price either. Our usual starting price for individual CD players and streamers is £350 each, which makes this two-in-one machine so attractive as a gateway to building your hi-fi system. It’s a clever, feature-packed performer that we urge you to consider.